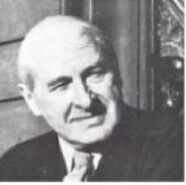 Professor Frederick Husler was a leading vocal pedagogue in Germany, and later in Switzerland, from about 1910 until his death in 1969. Professor Frederick Husler was born in Utah, USA in 1889 and died in 1969 in Switzerland. His father was Swiss by birth, his mother German, and on her husband&apos;s death when Frederick was eight she brought him and his brothers and sisters back to Munich to be educated. His family was particularly distinguished in the field of medicine and all were gifted amateur musicians. His first instrument was the cello. At the age of 16 he won an important scholarship with which to study sculpture. Although gifted in many fields (philosophy, anthropology, archaeology, art, natural science and sport), in his late teens (18) he turned to singing for which he had little natural aptitude. (“According to Lilli Dressler, a once famous Wagnerian soprano, his voice was rather less melodious than a crow’s ‘though perhaps you could manage bass parts in Wagner operas which should anyway be declaimed rather than sung.’” ) (From the private, unpublished papers of Yvonne Rodd-Marling). It was his determination to overcome this lack of talent which caused him to dedicate his life to singing. Since there was nowhere he could learn about singing, in the way he wanted to learn it, he taught himself. He was convinced that great natural singers are not a freak of nature and that therefore every normal human being should be able to sing beautifully. “How he developed his own voice into a dramatic tenor of great beauty, range and power is another story. Suffice it to say that he tried everything possible and impossible out on himself until, as his wife said, it is a wonder he survived to tell the tale. 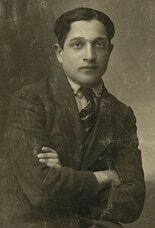 He was offered contracts from leading German opera houses (amongst them Siegfried Wagner at Bayreuth, Fritz Bush in Dresden) When he was twenty-five (1914), Bruno Walter, already at the height of his conducting career, wanted to make a world tour with him singing the title role in Verdi&apos;s ‘Othello’”. (From the private, unpublished papers of Yvonne Rodd-Marling). By the time he was twenty-seven he was well known as a teacher in Munich with more pupils than he could take. “He was just married when America joined the Allies in the First World War. The young couple were living in Munich and most of his income came from the United States. Because of his American passport he found himself confined to the City limits and practically penniless. At a quarter to five every morning he would slip unobtrusively into a laboratory adjoining a dentist’s consulting room and make dental plates (which he was never taught to do.) These were made meticulously by hand and so perfect that years later letters continued to arrive offering him almost anything he would like to ask if he would ‘give up this foolish idea of singing and return to the making of dental plates.’ This work occupied his mornings. 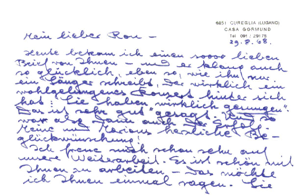 Afternoons he gave singing lessons and worked on his own voice while the nights were spent in tremendous discussion with the intellectual elite of Munich: Thomas and Heinrich Mann, Wedekind, Werfel, Rilke, and so on. It was just after the war that he took up another hobby: entomology, specializing in the biology and geo-biology of the coleoptera. When he and his wife moved to Berlin and then to Steinhude am Meer the rare plants (grown by his wife) contended with rare insects hatching out under observation which were later presented to the Natural History Museum in Munich.” (from the unpublished private papers of Yvonne Rodd-Marling). In 1922 he and his wife Marion moved to Berlin, where he became Head of vocal studies at the famous Stern&apos;sche Conservatoire. In addition he had a large private practice. The Ensemble of the Kroll Opera (Berlin) under Otto Klemperer was placed as a whole in his care. Those who heard its performances considered its standard of excellence unrivalled. He was the expert consulted by eminent conductors (Furtwängler, von Karajan and Sargent among them) for advice on their singers&apos; problems. From 1936 to 1939 Professor Husler was Head of the department for vocal studies and of the Master Class for Singers at the Konservatorium der Reichshaupstadt Berlin (founded by Julius Stern). 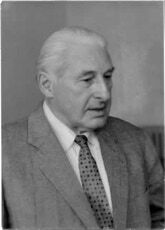 He was co-founder and Head of the voice department of the Nordwestdeutsche Musikademie in Detmold (together with the professors Wilhelm Maler, Conrad Hansen, Munch Holland and Max Strubwhich) from 1946 to 1961. At least sixty singers from Husler&apos;s class emerged as soloists, many achieving international recognition. In 1961 he and Yvonne Rodd-Marling opened their school in Switzerland under the patronage of Otto Klemperer, Herbert von Karajan, Sir Malcolm Sargent and Sir William Glock. ". . .besaß er eine Gabe, welche schwer erklärbar ist: das ,Finden ohne zu suchen‘. Er konnte einen Stein aufheben unter vielen gleichgearteten Steinen, mit völliger Sicherheit, daß gerade unter diesem Stein eine besonders seltene, winzige entomologische Rarität, deren Schönheit sich nur unter der Lupe erschließt, verborgen sei." Audio file of Westdeutscher Rundfunk radio interview with Prof. Frederick Husler (November 24, 1963) regarding his work as vocal professor at the Kroll Oper, Berlin (1927 - 1931) Otto Klemperer was, at that time, the musical director. The interviewer is a Dr. Curjel. Recorded in Lugano, Switzerland. An English translation follows. I received today such a nice letter from you which sounded so happy - especially as you write as a singer with a successful concert behind him: “You really sang.” That is well said. That’s why it was such a success. Marion and I send you our hearty congratulations. I am happy over our continued work together. It is lovely to work with you - I just want to tell you that. You are not hysterical, yet sensitive and always involve your heart and head, yes, and also talented and that makes me happy. Yvonne is still in London. We leave for Italy on the 9th - the island of Elba. Once again to swim in the sea. And you are right - with all that is beautiful here, there needs to be salt water too. 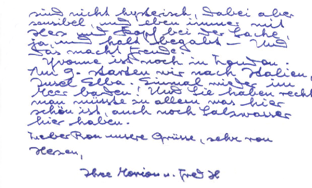 Yours, Marion & Fred H.
Husler: Nearly all members of the ensemble were given in trust into my hands. A pleasant, but difficult duty. For the selection of singers wasn’t necessarily made according to voice and vocal faculty but to their kind of personality, intelligence, musicality and so on. Dr Curjel: Who were the most famous among these singers? Husler: Jarmilla Novotna, who later went to New York to the Metropolitan Opera. Or Kaethe Haidersbach. She became very famous as Evchen in “Meistersinger” in Bayreuth. Or Maria Schult-Stormburg and Moje Vorbach, two very distinct personalities. They went to the other house Unter den Linden later. And a very impressive personality: Iso Golland, the Russian. He returned to Russia and has become a highly respected pedagogue. Dr Curjel: Were those singers types one would, nowadays, call “stars”? Husler: Stars? No, there was nothing of the kind and couldn’t be. If my memory serves me right the contracts were general contracts with the company and not specifically for a particular role. I must say, a rather wise practice. Dr Curjel: Did the singers perceive the artistic directors as authorities or, as it was sometimes claimed, as tyrants, or even as wild-beast tamers? Husler: Yes, as tamers, no doubt. Even as tyrannic tamers. But also as authorities. The singers believed in the approach and submitted to the idea. It was a very committed team. The undertaking they belonged to certainly had many friends but also strong enemies. This alone caused them to stick together. They were supposed to, and wanted to, prove something. Their comradeship was extraordinary. No intrigues would arise. I remember that before rehearsals for a performance of “Die Verkaufte Braut” three “Brides” were sitting in my room. Novotna, Haidersbach and Zaezilie Reich. I remember them discussing, absolutely unselfishly, who of them should sing. Haidersbach said Novotna was the original Czech. Novotna said that Haidersbach had the more suitable lyric voice, whereas she herself was a coloratura soprano. And Reich then put forward an argument (and against herself) to the benefit of the whole group. Where could you find such a thing? Dr Curjel: What were the consequences for the singers of such an artistic approach as that of the Kroll Opera? Husler: They were all driven to extremes. The rehearsals were endless and the singers were pushed to the very limit. But, as the future showed, nobody was harmed! Dr Curjel: What about the so-called “respect for the work”? I remember this was regarded as most important in the Kroll Opera. Husler: Yes, this “respect for the work” stood at the top of the list in all our work at the Kroll Opera. Now, what did that mean? First of all, accuracy in what the composer had written in his composition. But, furthermore, the music isn’t meant to be a vehicle for the singer’s beautiful voice or her/his private emotions. Often even this is only a cliche and sometimes even a self-imitation of the cliche. Let me give you an example. In Verdi’s works, a dotted eighth note can be a strong dramatic expression. If the singer ignores this - as it often happens - and he is fairly gifted, he will try to compensate his omission with a private motion which approximately matches the action on the stage. Well this is, of course, not respecting the work. Dr Curjel: In taking the dotted note seriously, many of the singers possibly would have felt limited by the precision? Dr Curjel: And from the singer’s point of view, precision presumably is the basis for the singer’s expression. Dr Curjel: So could one say that precision, and a certain limitation, in fact leads to true artistic freedom? Husler: Yes, to artistic freedom, and I’d say the composer knew better than the singer how his work should be performed. Dr Curjel: It is very important to hear this of a singing pedagogue. Many have just the opposite opinion and believe they know better than the composer, and change things. Husler: No, I think one has to swallow one’s pride and acknowledge the right opinion. The singers of the Kroll Opera formed an ensemble I have never seen before or since. It was a tough and advanced school for the singers and I can say it influenced the rest of my life.